Feel confident knowing you have the hottest, most effective pepper spray on the market, right in the palm of your hand. 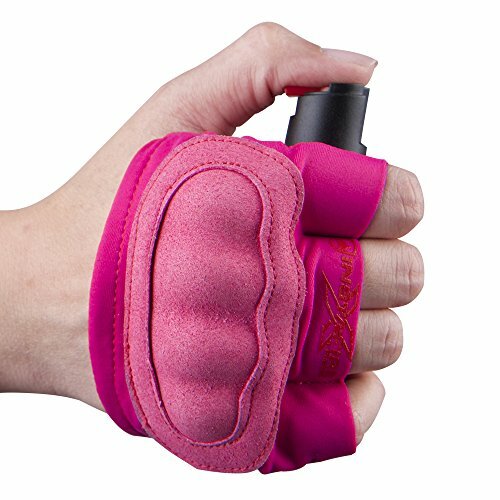 The Instafire Xtreme Self-Defense Pepper Spray should be an integral part of your activewear and a must-have accessory when exploring outdoors. With the push of a button, the Instafire Xtreme Pepper Spray fires a powerful, potent dose of Oleoresin Capsicum, or red pepper to instantly disarm an attacker. A quick release twist top allows you to unlock and fire with just your thumb, saving you valuable time. Avoid any accidental discharges with a built-in safety lock. The Instafire Xtreme Pepper Spray will keep you out of harm's way with a contact range of 16 feet. Fire the pepper spray with unbeatable accuracy and give yourself plenty of room to maneuver and escape. Reinforced rubberized knuckles give you a second layer of defense should an attacker come into close contact. Guard Dog’s unique red pepper spray solution contains invisible ultraviolet dye that will not wash off and will help law enforcement identify an attacker after use. A collar clip keeps the hidden pepper spray canister in place while you run, hike, jog or walk. The comfortable nylon-spandex hand sleeve slides on and off with ease and is durable yet soft against your skin. Designed with outdoor enthusiasts in mind, the hand sleeve is form-fitting yet flexible, giving you the full range of movement you need. The lightweight and sweat-resistant fabric keeps you cool and dry. Guard Dog Protected 4 Life program guarantees that you will continue to stay safe in the future. When you enroll in this completely free program with the purchase of any Guard Dog concentrated pepper spray, Guard Dog will replace your canister when you use it for free! Ready when you are - Guard Dog tests each Instafire Xtreme so that your concealed pepper spray sleeve is guaranteed to be the quickest, most accessible police pepper spray on the market. Stay protected, stay active. Buy your Instafire Xtreme Pepper Spray today! PROTECTED 4 LIFE: Free replacement pepper spray if you use the Instafire in self-defense! If you have any questions about this product by Guard Dog Security, contact us by completing and submitting the form below. If you are looking for a specif part number, please include it with your message.